A long wait, months of rumors, 1000+ dollars and you have finally found Nirvana! 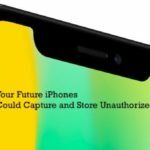 To continue that spirit of exuberance, you will need to quickly get yourself familiarized with a few things to get the best out of your iPhone X. Here are a dozen basic tips that will get you started on the new iPhone X before you spend hours with the new Animojis. 3 Where are my iPhone X Status icons? If there is one pressing reason you have shelled out extra dineros, it is precise to take advantage of the new front facing true depth camera. 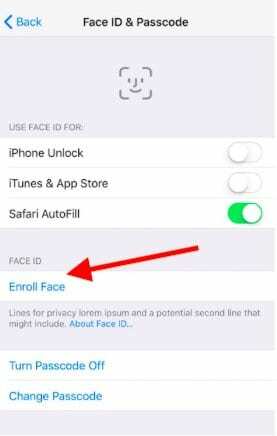 Setting up the new FaceID feature on your iPhone X is pretty simple and straightforward. Tap on Settings > PassCode & FaceID. Here on this screen tap on Enroll Face to get the process started. Position your face within the on-screen frame and then gently move your head while continuing to look at the camera. You will need to move your head and not the camera. It works better when you hold the iPhone X with both hands at about 15 to 20 inches from your face. Follow the on-screen directions to complete the setup process. The FaceId setup requires two separate scans to capture the FaceID. In the event, you decide to delete the FaceID and redo it all over again; you can do that as well. Tap on Settings > FaceID & Passcode. After you provide your credentials, tap on the Face you want to delete and then tap Remove Face Data. Once you have this setup, unlocking your iPhone X is a breeze. Simply look at the screen, and it will unlock your device. I wouldn’t disable the FaceId, but if you do want to disable it for some reason, you can easily do that in the Settings > FaceID & Passcode or press the Right button five times in quick succession and then choose to Cancel on the prompted screen. The A11 Bionic chip uses machine learning to recognize changes in your appearance. Put on glasses. Wear a hat. Grow a beard. Your friends might not know you. 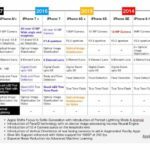 But iPhone X will. There has been a lot of questions around FaceID security. 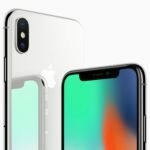 Apple has published a detailed guide around the various aspects of FaceID security. This should answer all your concerns. Now that we are done with the basics of FaceID let’s take a tour to review some of the other features. With the new iPhone X, Apple has made it convenient to access the camera or the light feature instantly. 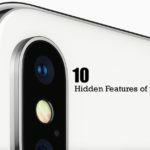 As soon as you unlock your device via FaceID, you will find the camera and the torchlight icons at the bottom of the screen. You do not even need to swipe left to access the camera. The camera now lets you access the new Portrait Studio for Selfies. Once you have taken a photo, you can access the various lighting options by tapping on the little icon and choose from a wide variety of choices. Where are my iPhone X Status icons? Ahh…The Notch. 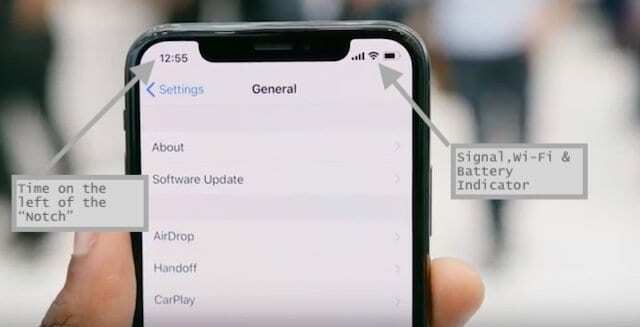 This feature comes in between your various status icons on your iPhone X screen. If you have wondered about the “notch,” trust me you will get used to it very quickly. Your time displays on the left of the notch and the other status such as Wi-Fi and battery is to the right of the notch. Depending upon the screen color, the text can change from a dark font to a light font automatically. On a white color app such as Apple music the font adjusts to black while on an app like weather, the font automatically turns white. Little stuff, but Apple knows how to do it right! 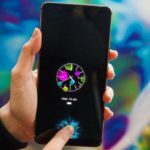 While watching videos, you can set it up to ignore the notch or just tap on the screen once to show the notch, but this time your entire screen provides you with the immersive experience. 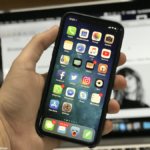 It’s very normal to feel a little lost once you have unlocked your new iPhone X. Apple has designed new gestures that make it super easy to navigate the iPhone. It does take a lot or some getting used to! Regarding the essential gestures, these are divided into two categories. You have your Swipe Down and the Swipe Up variants. Swipe down from the top left corner or top middle of the screen. This action brings up your notifications. Another easy gesture comes to rescue here. Swipe down from top right corner of your iPhone screen, and it reveals your iOS 11 Control center. All the 3D touch functionality is readily available with the new control center controls. Feel free to explore some of the best changes made to the iOS 11 Control center. This is another cool gesture that needs a little practice. Simply swipe down from the middle of the screen on your device, and it brings up the Spotlight Search. Swipe up from the bottom of your screen, and it brings up your home screen. To make it easy Apple has also added the “home bar” at the bottom of the screen. This provides you with a marker for your swipe-up action. Yup, you miss the home button!! You will get used to this new gesture very quickly. Apparently, you cannot press the home button twice in succession anymore. To get to the App switcher, Swipe up on the screen halfway from the bottom, and it instantly brings up the App switcher. Tap on the app that you want to use or slightly pull down on the app, and it immediately brings you to the app. 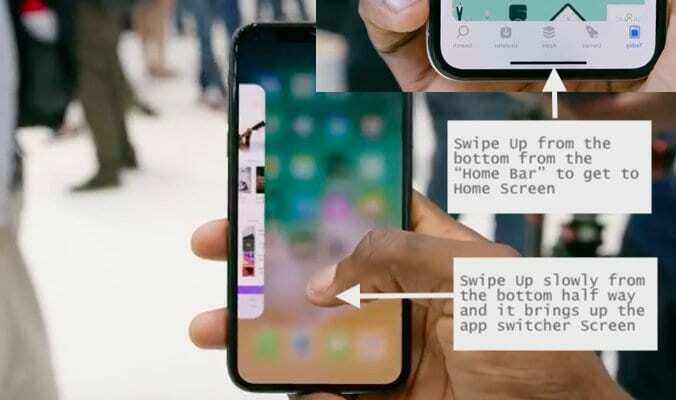 From here, you can swipe up from the bottom using the home bar to access your home screen or swipe up again from the middle of the screen to see the App Switcher. 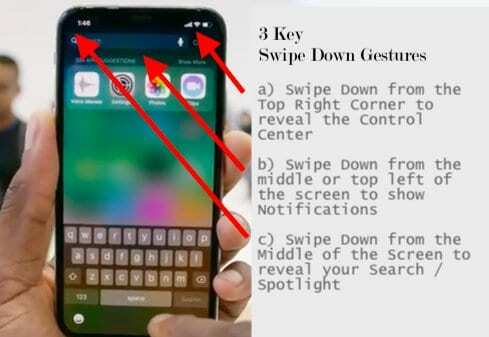 These basic five gestures are all you need to get started on your iPhone X. As simple as these sound, it does take some getting used to! If you don’t have Hey Siri setup and would like to start Siri with the press of a button, you are in luck. Push the sleep/wake button on the right side of your iPhone X firmly, and it will bring up Siri on your iPhone X screen. Since Siri is triggered by pressing the large right side button, this could trigger accidental Siri invocations when you are carrying around the iPhone X in your pocket. If it is a hassle for you, you can disable it by going to Settings > Siri > Press Home for Siri. You can also disable “Allow Siri When Locked” if you want your iPhone X not to use Siri when your device is locked. The Buttons on the left and the right side of iPhone X do a lot of heavy lifting apart from the new gestures introduced in iPhone X. Here are a few Button driven features that you will need to get familiar with. To take a screenshot with your new iPhone X, All you need to do is Press and hold the Sleep/Wake button (Right Side button) and gently press and release the Volume Up button on the left side of the device. You will see the screen flash with the image of your screenshot at the bottom left corner of your screen. The screenshots that you take are available in your photos app. Tap on Photos > Tap on Albums at the bottom, and you can scroll down to the screenshot in the built-in screenshots album. To use Assistive touch for Screenshots, you will need to turn on the feature by going to General > Accessibility > AssistiveTouch and enable it. On any of the devices running iOS 11, you can shut down the device by going to Settings > General > Shut Down. If you are trying to do a forced restart on your iPhone X, press and quickly release the Volume Up button. Then press and immediately release the Volume Down button. Finally, press and hold the Side button until you see the Apple logo. Getting into DFU mode for iPhone X is pretty straightforward from this point as well. Instead of releasing the Volume down button, if you continue to hold it down for another five seconds without pressing the Side (wake/sleep) button, you will be prompted by “Plug Into iTunes” screen which means that your iPhone X is in Recovery mode. Connect your iPhone X into your computer running iTunes and you can start the DFU process. Given the A11 Bionic chip’s superior processing power and the large on-board memory of 3GB RAM with 64GB+ of storage, you will not need to be putting this baby into forced restart/recovery mode too often. This is probably one of the best features of the new iPhone X. We can easily imagine folks spending hours at end with this new feature. Expect a lot of new animojis to come your way when you get the new iPhone X. This feature is easy to setup and use. Tap on the iMessage app to open it. Once you are in the app, try composing a new iMessage. Click on the little animoji icon to reveal the feature. This will open up a small window on the screen and it will show the default animoji. You can choose between 12 different animojis by tapping on the button to explore them on the left. Once you choose one and point the camera, it will replicate your facial expressions. 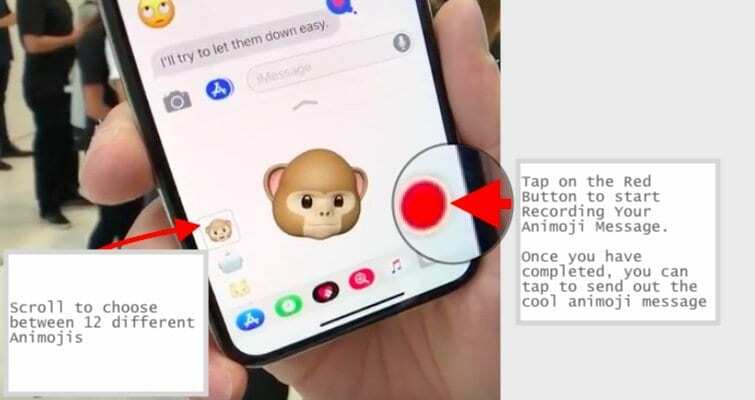 If you want to record an animoji based audio message, you can do that as well by clicking on the little red icon towards the right of your screen. Once it has been recorded and reviewed, simply tap to send it across in the iMessage. We hope that you found these dozen tips helpful!! Please let us know which of the new features are you really loving on your new iPhone X.